ON THIS DATE (September 12, 1979) ... It came, simply, a ground ball between first and second base past the lunge of Yankee Willie Randolph in the eighth inning of a 9-2 game that had nothing but Carl Yastrzemski. It came, simply, after an agonizing wait, like Odysseus limping home across the bed of coals. It had taken three days and 13 trips to the plate since hit 2999, each time limping out with his cleat on his left foot, his sneaker on his right, but when he pulled the pitch of a Dartmouth man named Jim Beattie through into right field, Yaz had reached home. And the first to him as he pulled up at the first base bag was his son, Carl Michael Yastrzemski Jr., followed by teammates and coaches and fans and security people and Yankee players. The megaboard flashed “3000, 3000” and “Yaz is the first American Leaguer to have 3000 hits and 400 homers,” and the 34,337 people stood and cheered and tiredly relaxed. The stories of his first hit, April 11, 1961 - his first game, also the first game of Charles Oscar Finley as owner - of Kansas City pitcher Ray Herbert unfolded again. The irony of Carl Michael Yastrzemski now playing for the then A’s catcher, Haywood Sullivan. 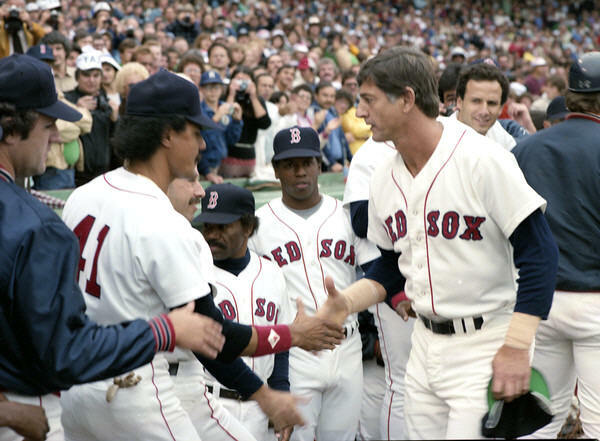 With Fred Lynn sick with a virus, Yastrzemski was put in the third spot, so when Ted Sizemore, Boston’s second hitter, moved towards the plate, Yaz emerged from the dugout, cleat on left foot, sneaker on right, to a warm, standing ovation. It wasn’t like it was Monday night, but it had been a long wait. However an old nemesis, Catfish Hunter, against whom Yastrzemski batted but .209 in this decade, wouldn’t mess with The Captain the first time up. He dangled four pitches around the plate - fastball away, slider in, fastball low, slider in - and walked him on four pitches. The crowd roared its disapproval. Jim Rice hit Hunter’s next pitch into the net in left center for a 2-0 Boston lead. When Yastrzemski came up again leading off the third, there was an uneasy calm, a kind of polite applause, reverent, not demonstrative, and when he jumped on an 0-1 pitch and sent it towering towards the Red Sox bullpen, the entire audience stopped en route to its feet. But Reggie Jackson slowed down as he reached the warning track, turned, tapped his glove and caught the ball, looking up at the flag indicating the wind that held it in. Some bleacherites chanted obscenities to Reggie. The wait had begun to become a tease. Try No. Three - and tenth since hit 2999 Sunday - came in the fourth, with two outs, Sizemore at third and the Red Sox ahead, 5-1. Yaz rapped a hard grounder inside the first base bag, but Chris Chambliss stabbed it, beat him to the bag and prolonged the agony. It made Yaz 13 for 78 in the last 21 games, 0 for 10, and even more tired. The agony continued when Yastremski’s fourth chance in the sixth inning was a ground ball that second baseman Willie Randolph backhanded. He appeared tired as he limped back to the dugout. The crowd sounded tired. He stood at the microphone, simply, a 40-year-old man who grew up on a Long Island potato farm, a mile and a half from the nearest house. His arm was around his son, his father to his left, and he waved his right arm to his wife Carol behind home plate. There were awards and a few kind words but the crowd chanted for him.